Hace bastante tiempo que no me enganchaba de esta manera a un libro, y la verdad, exceptuando el final del mismo, la historia engancha muchisimo. Antes de indagar os copio de que va.
Lovecraft nos habló brevemente de un libro fascinante, el Necronomicón, o Libro de los Nombres Muertos. Nadie sabe con certeza si dicha obra existió o es fruto de la imaginación del genial escritor estadounidense. Esta sobrecogedora novela narra el periplo de esta obra, desde que fuera escrita en el siglo VIII, hasta nuestros días. Una trepidante historia que enreda al lector en su poderosa trama desde el principio. Una novela cargada de misterio e intriga que cautiva hasta el inquietante final. Sectas, bibliófilos, periodistas, Berlín, Nueva York, Londres, Madrid, Tokio, Damasco… Una aventura inolvidable. La historia, que ya la hemos podido ver en otras obras literarias, pues má so menos es lo de siempre, ecargo de trabajo, asesinatos, gente rara y sobre todo un ocultismo hasta el final de la novela. Varias ciudades, personajes ( a veces liosos) hermandades secretas ( los nombres de las mismas son un poco plof) pero sobre todo una narrativa muy buena en unas 4 horas de lectura que no dejará indiferente a nadie pero sobre todo, gustara a los amantes de los libros de terror. 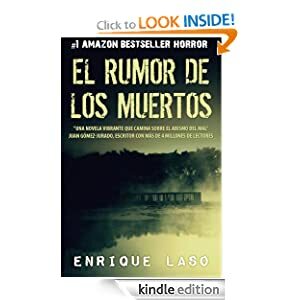 Sobre al autor podemos decir que se trata de un escritor amateur con muy buena base a la hora de escribir, y actualmente esta siendo numero 1 en amazon kindle debido a que el lirbo que comentamos estuvo unos dias de forma gratuita. Sin duda, para mi, una grán sorpresa que me ha gustado muchisimo y estará dentro de mis favoritos. También se encuentra en edición impresa. Ganas de más? No te olvides de leer otras de mis reseñas y criticas. Just about all of what you mention is astonishingly precise and that makes me ponder the reason why I hadn’t looked at this in this light previously. This particular article truly did switch the light on for me personally as far as this specific subject matter goes. However there is one issue I am not too comfy with and whilst I attempt to reconcile that with the central idea of the position, allow me see what the rest of the subscribers have to point out.Very well done. The very next time I read a blog, Hopefully it doesn’t fail me as much as this one. After all, I know it was my choice to read through, however I actually believed you would probably have something interesting to say. All I hear is a bunch of crying about something that you can fix if you were not too busy looking for attention. This is the perfect web site for anybody who wants to understand this topic. You realize a whole lot its almost tough to argue with you (not that I actually would want to…HaHa). You certainly put a new spin on a subject which has been discussed for decades. Excellent stuff, just great! Hi! I could have sworn I’ve been to this blog before but after browsing through many of the posts I realized it’s new to me. Anyhow, I’m certainly pleased I discovered it and I’ll be book-marking it and checking back often! In the awesome design of things you secure a B+ with regard to hard work. Exactly where you misplaced me personally ended up being on all the particulars. You know, people say, the devil is in the details… And it couldn’t be much more correct here. Having said that, allow me say to you what did work. Your authoring can be really powerful and this is most likely the reason why I am making the effort in order to comment. I do not really make it a regular habit of doing that. Next, despite the fact that I can certainly notice a leaps in reasoning you come up with, I am definitely not certain of how you seem to connect the points which inturn help to make the actual final result. For the moment I will, no doubt yield to your point however wish in the future you link the facts better.